What Is A Color Modifier? It is commonly accepted that fancy colored diamonds are organized into 27 distinct hues. As we can see from the graph below, only a handful of fancy colored diamonds are comprised of solely one color in the vast color spectrum. 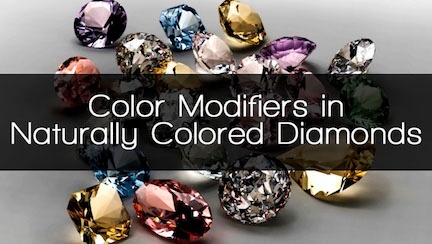 Most gems illustrate a second or third (and in rare instances even a fourth) hue in their original color category, these additional colors are known as modifiers. When grading multi-colored diamonds, modifiers are always mentioned at the beginning of the stone’s color description followed by the dominant color. It should be noted that color modifiers are mentioned in grading reports only for diamonds of at least “Fancy Light” categorization. If a stone is under the minimum grading, the color modifier’s mention is dropped, and only the dominant hue will be listed in the report. From the table above, you may have noticed that some modifiers have the suffix “-ish”. This occurs when graded diamonds have color modifiers consisting of 15-30% of a diamonds overall hue. If the percentage, however, drops beneath 15%, the mention of the modifier is dropped completely. For an example, a fancy yellowish (12%) orange (78%) gem will appear on a GIA report as a plain "fancy orange diamond." 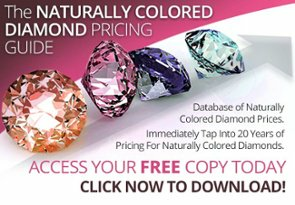 How Do Color Modifiers Affect Diamond Pricing? Fancy colored diamonds do not have set prices. Their cost is determined using a combination of numerous factors including the stone’s 4Cs, rarity, and market demand. While these are all objective measurements, the most important determinant of a diamond’s price will be the face-up appearance of its overall color, a rather subjective matter (we will see the reason behind this later on). This subjectivity coupled with the rarity of single or “pure” colored diamonds has caused a few people to misconceive additional hues as having a negative impact on a stone’s beauty and value. This, however, is not the case; or at least not entirely. The value of a naturally multicolored diamond is directly related to the rarity of the color modifier in relation to the stone’s dominant color. As a general rule, modifiers with greater rarity than the dominant color will increase a diamond's value, and therefore its price. Conversely, modifiers with a lower comparative rarity will yield price discounts. Red is the rarest among all colors and belongs clearly in a class of its own. Blue, green, orange, and pink diamonds are considered very to extremely rare. Yellow is the second most common color among the fancy color spectrum. Brown diamonds are the most common as they are can be mined in every continent. From the above mentioned, we can conclude that a Fancy Orange-Yellow diamond will yield a significantly higher price than a Fancy Brown Yellow stone. It should be noted, however, that for this to be true all other factors of the 4Cs need to be equal. Factors such as higher carat weight, exceptional symmetry and polish, flawless clarity, and intense saturation can yield price premiums even for diamonds with common hues. This is where the subjectivity of beauty and preference of undertones discussed in the previous article come to light once more. A Fancy Orange/Orangy Pink diamond, for example, will warrant a price discount (when compared to a plain pink stone) despite the fact that orange is a more rare color than pink among fancy colored diamonds. The same applies for Fancy Greenish Blue diamonds. Blue is considered to have greater rarity than green, yet this color combination will result in a price premium compared to a solely blue diamond. This comes down to common predispositions related to colors caused by earlier exposures in our lifetime. We all relate specific color tones to certain pleasant (or unpleasant) objects or experiences causing us to inherently be more (or less) attracted to them, ultimately leading to price premiums (or discounts). This is why the face-up appearance of a diamond has such a drastic impact on prices. We hope you found our article both informative, as well as enjoyable. What are your favorite fancy colored diamond modifiers and why? Let us know on Twitter and LinkedIn!